Is it Australian or is it from New Zealand? The debate goes on. They both claim it originated in their country, so whoever did it is genius!! 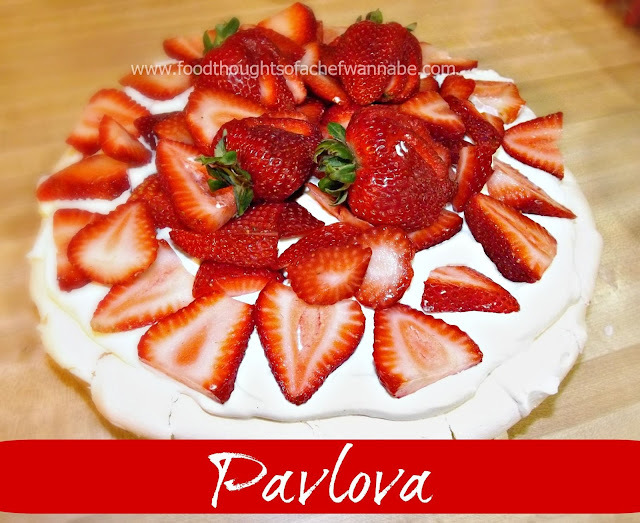 Pavlova is named after the famous Russian ballet dance, Anna Pavlova. The dish is said to have been created in honor of the dancer after or during one of her tours to Australia and New Zealand. This dessert is popularly served on holidays and celebrations. It is a meringue based dessert and is easily changed up to meet your taste. Since I made this the first time, it was a hit. The mix of textures is like a party for your palette. It is a sweet meringue cake, slightly sweetened whipping cream and fruit on top. Lets not delay this any longer, I can't stand the anticipation of sharing! Preheat oven to 300 degrees. Crumple up a piece of parchment paper and then uncrumple, dust with a bit of cornstarch and place on pan large enough to draw or eyeball a 9 inch circle or the size it should be. My bowl is being held upside down! Beat egg whites adding in granulated sugar 1 tbsp at a time. Beat until you get stiff peaks. Add in cornstarch and vanilla. You will know they are ready when you can turn the bowl upside down and the egg whites will not fall out. See I have a photo of mine, upside down! Spread on parchment paper to form approx 9 inch "cake". Make sure all sides are even. Bake 1 hour. Remove and let cool completely. Here you can see before it was baked and after! Clean fruit, slice berries if you are using them. Use a large bowl and pour in COLD whipping cream and powdered sugar. Beat until your whipping cream is a nice stiff peaks but don't go to far or you will have butter! Carefully spread on top of pavlova and top with fruit. HELPFUL HINT: When you are beating fresh whipping cream it is helpful to have everything very cold, put your beaters, whisk attachment or whisk in the freezer with the bowl you will be using for 15-30 minutes before using. Cream should be very cold as well. It will make it whip up MUCH faster. I hope you enjoy your possibly first pavlova experience. It is not one you are soon to forget! Pick your own favorite berry or combination of berries or kiwi. *Kiwi are traditional*. Wow, can't wait to try that one too. I've been behind in reading your blog. Love it and you as always.